OMG can you believe madness in the first degree, I want one. Everybody knows that any piece of art produced by Damien Hirst is a big deal. 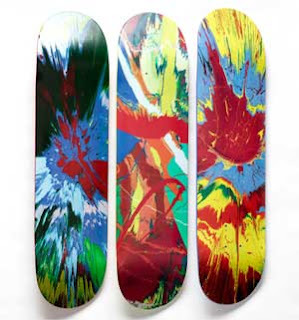 So you know when Supreme gets Damien Hirst to design a line of skate decks for them, it’s really a big deal! The decks are super fresh and would be great to just hang on a wall. No price has been released but there should be an announcement soon.